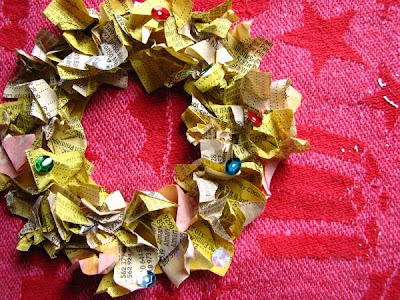 Do you remember the phonebook wreath from last year? We're gonna shrink it up a bit and make them itty bitty. These are not just for Christmas, you can make these for any occasion. Who says a wreath has to be for Christmas? We're making ours out of an old phonebook so already, we've broken a few rules so go for it! Hanukkah wreath? Sure! Kwanzaa wreath? Why not? Boxing Day wreath? Bring it on! New Years Wreath? Of course! You choose the colors and the celebration. Have fun! Okay, so we're gonna go small with this so send your wee one off on a circle hunt. 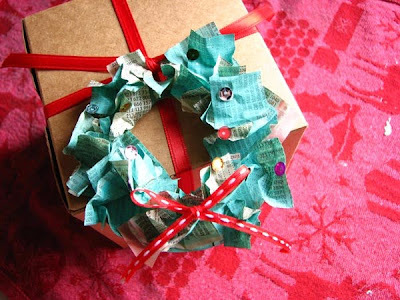 Explain how you are going to be making mini wreaths and ask your wee ones what shape they see when they look at a wreath. Next ask what they think would work as a pattern to use for their own wreaths. You can totally turn this into an exercise on shapes and patterns. If you do not have the time or your tot won't be too enthused, get a couple of cups from the cupboard and get ready to start. You will want two sizes. One for the full size of the wreath, and a smaller one for the center that you will be cutting out. I used a small glass and a bottle cap. Set up your work space with a splat mat or large sheet of wax paper under it all. 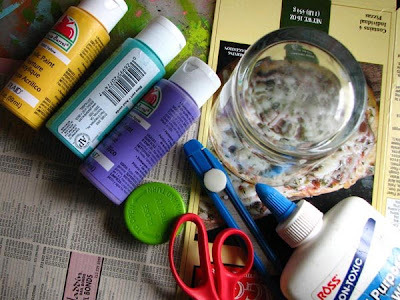 Kids & glue equal fun messiness so be prepared! 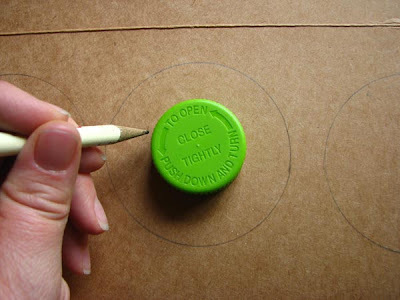 Flatten out the cardboard you will be using and get ready to grab some pencils and trace. 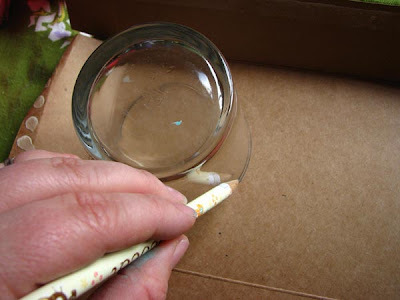 Have your kidlet trace around the outer edge of the cup or bowl you are using for your template. Have them center the smaller one inside the larger circle and trace that as well. Repeat as often as you like. You will hopefully want to make more than one. 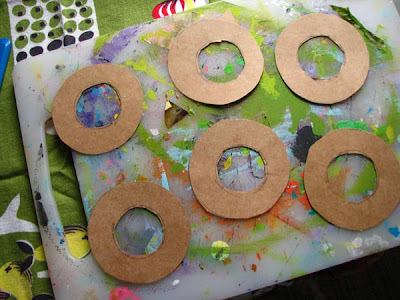 Use the scissors to cut out the larger circles. You child can do this part if they wish. You will need to cute the center circle out as it may require an exacto to extract. The circles do not have to be perfect. The crumpled paper will flesh them out. 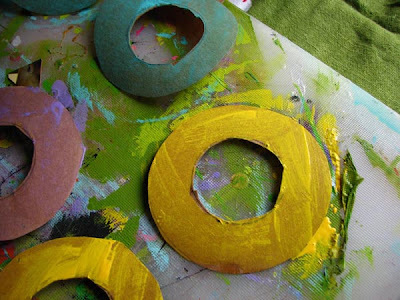 Once all your wreath shapes are cut, get to painting them the colors of your choice. Set aside to dry. 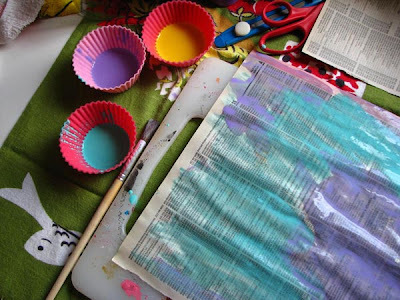 Have you child cover a couple of phonebook pages with paint. They can use as many colors as they like. If the pages get too saturated with paint they will rip, just so ya know, okay? Set aside to dry. Once dry, cut the pages into small squares about the size of a postage stamp. Or, 1" by 1". 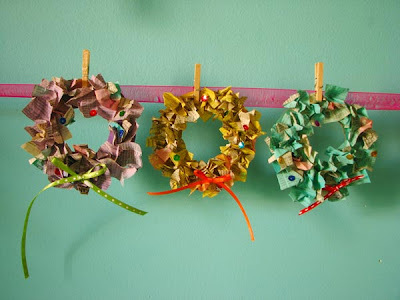 Cover your wreath shapes in glue and crumple up each little square and pop it onto the gluey goodness. Repeat until the wreath is as full as your child wants. Do you remember the tissue squares and pencil trick from kindergarten? You can do that as well. 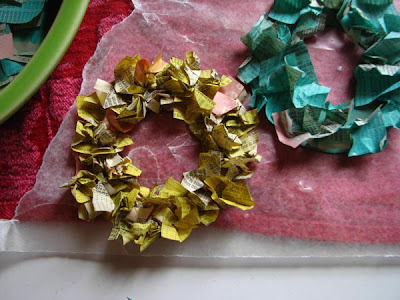 Once they are all dry, decorate your wreaths with sequins, ribbon, glitter or more paint. Set aside to dry if they need it. Punch a hole in the "top" of each wreath and thread with a length of string. Now you can connect wreaths to make a garland, top of your presents with them or hang them onto your tree. If you want to turn them into tags, cover the back with glue stick and affix a circle of paper onto the back. Write your To: & From: and you are done! Happy wreath making! If you want to stray from using phonebook pages and paint, cut your squares from tissue paper, you will want a "soft" paper for this project. Cute, simple craft project. This would make a great garland. Great reuse of phone ,and I love how kid-friendly this is! thank you everyone! i would love to see what you come up with! patty: check out the grown up versiuon for the pencil trick. thank you again! I have so many phonebooks and so little time! Thanks for this compelling craft tutorial! It's got it all! I love this mini version! Everything is cuter when it's miniaturized. =) Thanks so much for this, I'll be linking. These are adorable. My 5yr old would love these! I'm linking too...thanks!